2 1/2 tsp. butter, melted and cooled to room temp. Mix together Jemila Grape Leaf Mix, ground beef, butter and 1/4c water. Set aside. Remove core from heads of cabbage and blanch in boiling water until leaves are tender and easily separate from head, pulling off leaves as they are ready and put in colander to drain and cool. Once leaves have cooled, cut leaf in half and trim thick stem. To roll: lay leaf flat, place about 1T of mixture on leaf, form long and narrow like a finger. Fold one end of leaf over the filling, then roll in direction of open end ( just like rolling grape leaves but don’t fold the sides in, you can watch the video on our website). Place a layer of unused leaves in bottom of a 6qt. pot. Layer stuffed leaves in pot. Alternate direction of leaves in each layer. 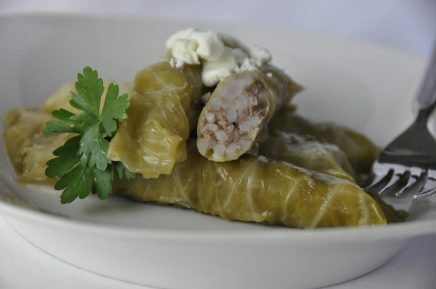 Stuffed leaves should be layered tightly but not squeezed together. Add garlic and lemon. Turn dish upside down and place on top of stuffed leaves inside of pot. Add water to cover dish. Cover and cook on high heat until pot comes to a boil. Lower heat to maintain a medium boil. Let cook for about 1 hour, until leaves are tender. Add water if it gets below level of top row of cabbage leaves during cooking. Do not add water when done cooking.